Throughout the 1960s and '70s, despite having the technology to land men on the moon, some of our lighthouses were still operated by oil, not only for the main navigation light, but also in the keepers' living quarters. With some of the offshore stations lacking even the basic facilities of running water, a bathroom or heating life onboard was, to say the least, pretty basic. The author's story begins in 1966 - a time when oil lights were rotated by a hand-wound clockwork mechanism and keepers handled explosive fog signals. Little did the author realize that he would witness, and become part of, a new technological age that would sweep through the industry. Unmanned lighthouses being operated by remote control via telemetry links to a computer and satellite information provided by GPS. Travelling extensively around the coasts of England, Wales and the Channel Islands, his 22 postings varied from offshore lighthouses, such as the famous Needles Rock at the Isle of Wight, where the men were confined to just a handful of circular rooms, to those located on beautiful islands such as Lundy in the Bristol Channel where the accommodation was more spacious. Due to their isolation, lighthouses and their keepers were in an advantageous position to assist the Coastguard and rescue services and the author describes how he became involved in two hazardous rescue operations for which he was awarded the Royal Humane Society bronze medal. With the onset of automation, it was frequently necessary for keepers to share their already-cramped living space with the contractors who installed the specialised equipment that would ultimately result in their redundancy. Although the introduction of helicopters was initially a godsend in overcoming late reliefs, it proved to be the nail in the coffin for the men of the service, as they offered virtually all-weather access. An Illuminating Experience tells the fascinating story of a way of life that has become a part of our maritime heritage. 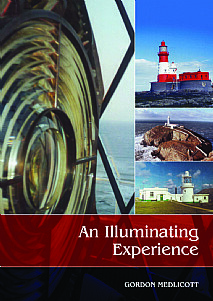 This will prove to be a must for everyone with an interest in lighthouses, maritime and social history. It will also be ideal for anyone looking for an entertaining and enjoyable read.